Pregnant women should avoid scooping litterboxes to help prevent the spread of toxoplasmosis- talk to your physician for more information. Toxoplasma gondii is a single celled organism that can infect warm-blooded animals including cats and humans. This parasite infects cats when they ingest infected rodents or other prey. Toxoplasmosis rarely causes significant illness unless large numbers of parasites are present or the cat's immune system is weakened. Once infected, the cat passes toxoplasma eggs, called oocysts, in their feces. 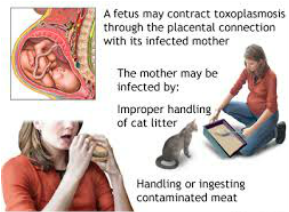 Toxoplasma becomes a human concern when immunocompromised people or pregnant women are exposed. Protect your cat by discouraging hunting and protect your human family members by wearing gloves when working with soil where feral cats may have defecated, cooking meat thoroughly, and not allowing pregnant women to scoop litterboxes. Visit http://www.vetstreet.com/care/toxoplasmosis-in-cats for more details.